Sock Summit took place Thursday – Sunday last week, and it was awesome. This was my first time attending, so I don’t know how it compared with 2009, but I loved every minute of this year. I loved my classes, learned cool new techniques, saw friends from many different (knitting-related) parts of my life, saw sheep being shorn, danced in a flash mob, watched a speed-knitting competition, ate at Burgerville (mmmmmmm, milkshakes…), and generally lived it up. One of the best parts of Sock Summit was just being surrounded by hundreds of people who share my non-mainstream hobby and who understand when you want to pet their clothing or examine its construction or stitch pattern. People who want to ooh and ahh over your yarn purchases and who get excited about meeting famous knitters. As soon as I walked into the Convention Center on Thursday morning I knew I was with My People. 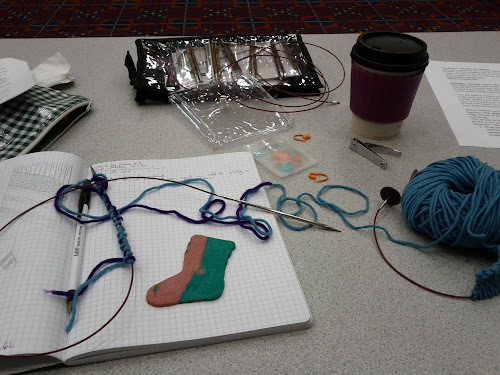 On Thursday morning I had “Strick-ly socks,” a toe- and heel-construction class with Candace Eisner Strick. I keep hearing about her “revolutionary new method” for sock construction and had yet to knit a pattern where it was used, so I was looking forward to the class—I’m always interested in new construction methods and sock architecture. 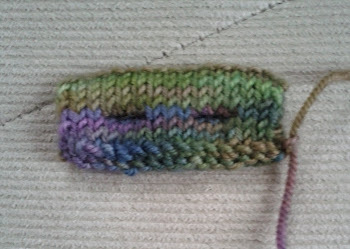 Candace was lively and entertaining, and I learned some bonus stuff like the Channel Island cast-on and the tubular bind-off. Plus one of my classmates brought us homemade sock-shaped cookies! 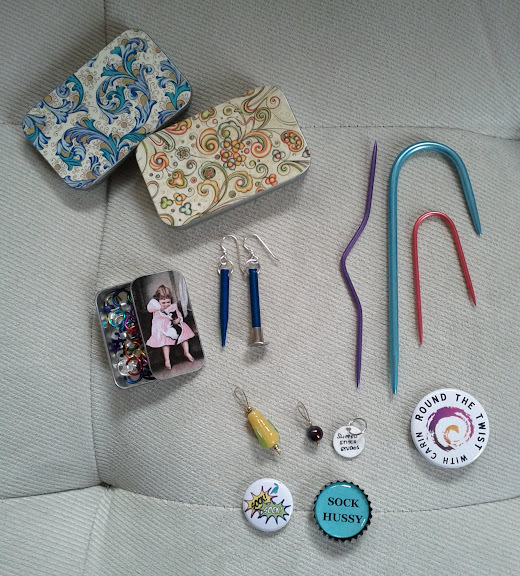 Thursday afternoon I got to meet Amy Singer and learned about what Knitty is looking for in pattern submissions. She even took a look at one of my patterns (Cheshire) and declared it Knitty-worthy! Apparently they’ve got a dearth of lace socks right now, so if you’ve been hoping to get into Knitty, there’s a free tip for you. It’s my first vanilla stockinette stitch sock, but I’m livening it up with some techniques I learned in my classes: arch shaping (from Lana Holden, designer of Skew), Candace Eisner Strick’s heel, and the tubular bind-off at the top. Look at that tidy little bind-off! I was so exhausted after browsing the Marketplace; why is shopping so draining? Maybe it’s the pressure of not wanting to buy too much “unnecessary” yarn (after all, I already have a wonderful stash at home), and simultaneously wanting to buy everything. 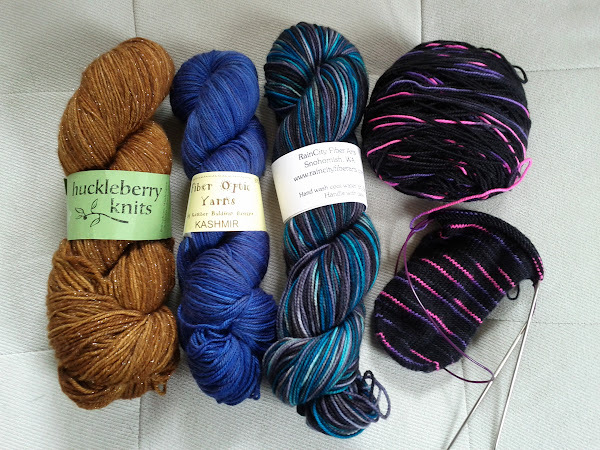 :-) I could’ve bought 20 skeins from Fiber Optic alone. Sunday may have been the best class day of all. I learned from Anna Zilboorg how to make the most lovely little buttonholes, which I will put into practice if I ever, ever finish my Cottage Garden cardigan. In the afternoon Anne Berk taught an ingenious intarsia in the round class. Ironically she started it by saying that there is no such thing as intarsia in the round, it’s just not physically possible. But then she proceeded to teach it to us. :) It’s gorgeous and clever and simple (once you get over all the crazy strands hanging off your knitting, and the fact that she makes you cut your yarn and work from a-few-yards-long strands instead of from the skein). I’ve already got a new pattern in the works that uses the technique! So good to see you! Is it Sock Camp yet? Knitty worthy indeed. I was surprised to see the bacon-maple ice cream was not a highlight, then again….